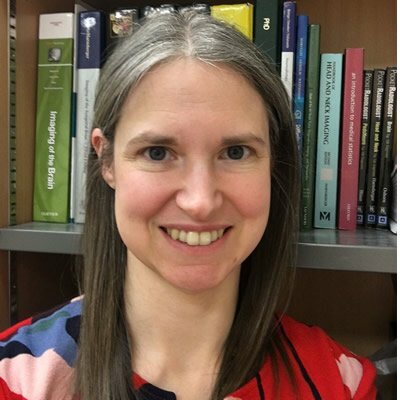 Dr Mills became a Consultant Neuroradiologist in January 2011 after completing her clinical training in Neuroradiology (Manchester Radiology Training Scheme). Prior to this she held a joint RCR/CRUK Clinical Research Fellowship, undertaking a PhD in advanced magnetic resonance imaging of adult brain tumours using novel MR techniques, including dynamic contrast enhanced MRI, diffusion imaging and oxygen enhanced MRI at the University of Manchester. Her academic interests include neuro-oncology, imaging biomarkers and translational research. In October 2014, she moved to the Walton Centre NHS Foundation Trust, Liverpool. Stivaros SM, Stemmer-Rachamimov AO, Alston R, Plotkin SR, Nadol JB, Quesnel A, O’Malley J, Whitfield GA, McCabe MG, Freeman SR, Lloyd SK, Wright NB, Kilday JP, Kamaly-Asl ID, Mills SJ, Rutherford SA, King AT, Evans DG. Multiple synchronous sites of origin of vestibular schwannomas in neurofibromatosis Type 2. J Med Genet. 2015 Aug;52(8):557-62. Linnik IV, Scott ML, Holliday KF, Woodhouse N, Waterton JC, O’Connor JP, Barjat H, Liess C, Ulloa J, Young H, Dive C, Hodgkinson CL, Ward T, Roberts D, Mills SJ, Thompson G, Buonaccorsi GA, Cheung S, Jackson A, Naish JH, Parker GJ. Noninvasive tumor hypoxia measurement using magnetic resonance imaging in murine U87 glioma xenografts and in patients with glioblastoma. Magn Reson Med. 2014 May;71(5):1854-62. Mills SJ, Thompson G, Jackson A. Imaging biomarkers of cerebral metastases. Cancer Imaging. 2012 Aug 10;12:245-52. Thompson G, Mills SJ, Coope DJ, O’Connor JP, Jackson A. Imaging biomarkers of angiogenesis and the microvascular environment in cerebral tumours. Br J Radiol. 2011 Dec;84 Spec No 2:S127-44. Thompson G, Mills SJ, Stivaros SM, Jackson A. Imaging of Brain Tumors: Perfusion/Permeability. Neuroimaging Clinics of North America 2010 Aug;20(3):337-53. Mills SJ, Soh C, O’Connor JP, Rose CJ, Buonaccorsi GA, Cheung S, Zhao S, Parker GJM, Jackson A. Enhancing Fraction in Glioma and its relationship to the tumoural vascular microenvironment: A Dynamic Contrast Enhanced Magnetic Resonance Imaging Study. AJNR Am J Neuroradiol 2010: Apr;31(4):726-31. Mills SJ, Soh C, O’Connor JP, Rose CJ, Buonaccorsi GA, Cheung S, Zhao S, Parker GJ, Jackson A. Tumour enhancing fraction (EnF) in glioma: relationship to tumour grade. Eur Radiol. 2009 Jun;19(6):1489-98. Jackson A, O’Connor J, Thompson G, Mills S. Magnetic resonance perfusion imaging in neuro-oncology. Cancer Imaging. 2008 Oct 13;8:186-99. Mills SJ, Patankar TA, Haroon HA, Balériaux D, Swindell R, Jackson A. Do cerebral blood volume and contrast transfer coefficient predict prognosis in human glioma? AJNR 2006 Apr;27(4):853-8. Patankar TF, Haroon HA, Mills SJ, Balériaux D, Buckley DL, Parker GJ, Jackson A. Is volume transfer coefficient (K(trans)) related to histologic grade in human gliomas? AJNR 2005 Nov-Dec;26(10):2455-65.